Deep Roots Music Festival 2017 … what a weekend that was! Great music. And stories. And musical discoveries. Friendly, engaged participants at shows, in the streets, at the workshops. Smiling faces everywhere. Someone usually says … this one was the best one yet! Was it? Do you have any comments/suggestions that didn’t get written down on a festival survey, the paper version? Some people requested that we post the survey online so they could fill it out that way. We are happy to accommodate since we are always eager to hear about people’s first hand experiences … any and all critical feedback is gladly received. … the sooner, the better. The Valley Arts Award is presented to someone who has made a significant, long-term contribution to the Arts in Nova Scotia’s Annapolis Valley. This year’s winner is Ken Shorley – a diverse percussionist who specializes in the hand drumming traditions of the Middle East and India. Though he’s been based in Wolfville for over 20 years, his musical passions have taken him around the globe. Ken is also an avid player and teacher of Indonesian gamelan music. 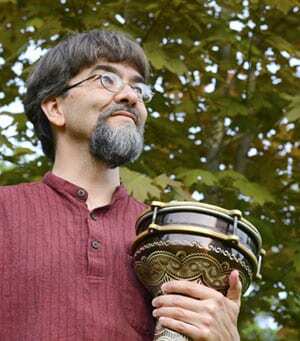 His ensemble, Mindful Flower Gamelan, is the first of its kind in the Maritimes and performs traditional and contemporary music for gamelan degung. The group’s first recording, featuring new gamelan music by Canadian and Indonesian composers, is currently in post-production. In recent years, Ken has been a featured performer at the Halifax Jazz Festival, Sound Symposium, Prismatic Festival, Lunenburg Folk Harbour Festival, Sunfest, Mosaiq Festival, here at the Deep Roots Music Festival, and on national broadcasts for CBC Radio 2. Ken is also the co-director of World in Wolfville, a community organization that has, for more than 10 years, focused on presenting world music concerts, workshops, and happenings in the greater Wolfville area. (Watch for a return of their popular “Drum Night” happening this November!). Some of Ken’s current projects include teaching Gamelan and World Music courses at Acadia University; leading the 10-piece Turko-Balkan dance party band, ORO! Orkestra; composing and touring with his hand-drumming group, Ken Shorley Trio; collaborating with cellist India Yeshe Gailey in the chamber music duo, Bonsai; and sharing the stage with the amazing Nasr sisters (Ariana, Sahara, and Kamila) in the world music ensemble, ASHK. Ken will receive the 2017 Valley Arts Award at our Festival Finale on Sunday. Deep Roots Music Festival 2017 is fast approaching. Have you got your tickets? To start the whole wonderful weekend off, and with thanks to the support of Atlantic Presenters Association, RADARTS, and Canadian Heritage’s Canada 150 Program, Lennie Gallant brings his show Searching For Abegweit from a three year runaway theatrical hit in PEI to our Deep Roots’ stage. We’re thrilled and so looking forward to this year’s festival kick off. 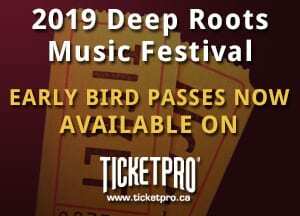 This year’s Deep Roots Music Festival two page, downloadable schedule is now available. If you have been waiting to buy tickets until you had more specific details, the time has arrived! Check it out. Download it. Make copies. Pass along the good news. Pass it along to friends. Put it up on your fridge. Anticipate and look forward to another great festival. Don’t wait to buy tickets and risk a sold out show. Tickets on line through Ticketpro. You can also drop by any of their outlets … in the valley, those would be Wilson’s Pharmasave, Berwick and Kentville; Cochrane’s Pharmasave, Wolfville; Home Hardware, Windsor. Tickets to individual shows are now available. Head over to Ticketpro for tickets and/or 3-day or 4-day passes which are also still available there. Shows, especially the main stage, do sell out so don’t wait! Buy your tickets or passes now. We are excited to announce that Deep Roots Music Festival has once again been awarded funding in support of an Assistant Festival Coordinator leading up to our 2017 Festival. Thanks to our MLA, Keith Irving, for this wonderful news. Are you a student returning to full time studies in the fall and interested in joining our dynamic team? The 2017 Festival will not disappoint -13 years of successful annual festivals – and the tradition of bringing exciting, diverse music to our stages continues! If you are new to the Deep Roots experience, check out previous year festival line-ups under Archives to get an idea of just how many amazing musicians have entertained us. And yes, 2017 is going to be great! Why not give someone/everyone the gift of music, an experience to remember rather than yet another dust collector? ?